I've shared a lot of things in my life since I turned this blog into a 'Lifestyle blog' type. I included almost all my lifestyle of wearing new outfits, playing with toy cars such RC's and having fun. Also, experiences I do or go through and celebrate together our victories at the end of every month. However, something I also do new life updates which keep you update with my life what I do as I share other things. The last month of the year 2017, I decided to share what I'm going to do and where I'm going to travel in the new year which is what we are in today. In case you've missed the post, you can check it here. However, we are not that far from the end of this year which makes it a failure for not achieving what I wanted to do and in this post I'm going state why and I'm going to mention more stuff that might be interesting letting you know about it and my experience on not getting what you want on time. 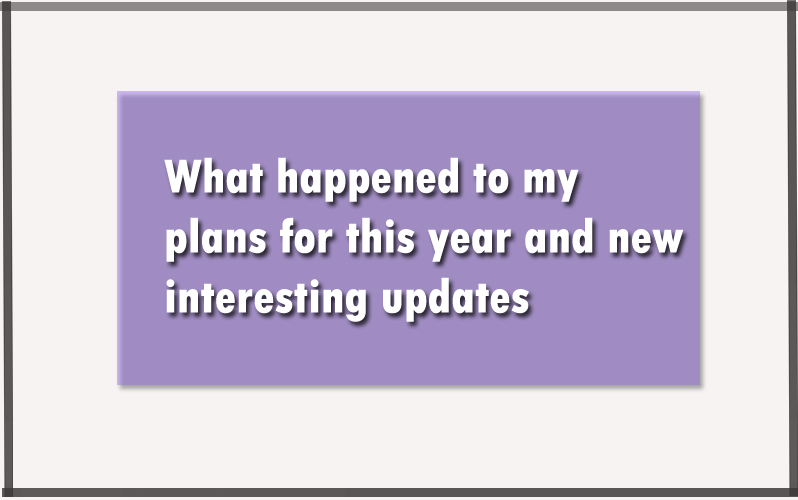 I was excited when I wrote my plans, I just started working on it right after that post went live on my blog. It was such a great thing and huge to me dreaming about something big and beyond the limitations. They said, 'aim for the moon and you will land somewhere around it' which mean always aim for the biggest and eventually, somewhere close is what you will land at. There is must be failures in our life in anything we do and that is how we learn, but when you keep failing over and over, you start losing motivation or maybe excitement if you were. However, the only reason to keep the inspiration inside you is that you really love it and want ti so bad or something that enjoyable to do. My plans were something really important to me and special because there is a lot of special things could've happened. I'm going to be honest with you when I knew that it will be impossible for me to achieve my plans, I just felt like it's the end of the world and lost all my motivation. However, knowing that everything should happen after failing and this is something I should, I was able to gain little motivation to keep me going and then it started growing back which is something good. One of the things that always help me to gain motivation after losing it is by listening to other successful people's stories and quotes. You need to remind yourself of why you started whatever you are doing and why you kept trying. Also, knowing and saying every day that there is nothing comes overnight which really helped to gain motivation for another year attempt. I think I'm going to add motivational stories and posts in the blog soon because it is really good to help other through their tough days. What you think? I was thinking of this before and I wasn't sure about it because maybe, there some people won't find it interesting as I speak my own words from my experiences. This idea still under process and studying and maybe, soon I will make the decision, but your opinion would be appreciated if you would like to read motivation stories and stuff from me on this blog. I loved video games for almost my life and I've been wanting to keep memories of me playing games and watching them again since I started. Last week, it was my first time watching twitch streamers in my life and I started a twitch channel to be live while playing games on PS4 and keep them on there because of thought, it will fun to stream and in the same time, I can keep them or download my gameplay on my laptop. A fact about me did you know that I was a game lover since I was a kid and the first console was PS1 and kept playing until the current console which is PS4. However, never tried the Xbox in my life and maybe, in the future I will be able to play though I don't how the controller works on that console haha. As for now, I paused streaming for a while because I'm trying to get a decent setup to start well with mic and everything. I will be using the same social media profiles for my twitch and my blog because I can't manage more than one. It will be announced in my blog and the main account which is twitter soon when I have the decent setup. The main purpose for my blog right now is entertainment with funny things in different things in my life, but I'm going to post from time to time on the old topics as well because it's part of my life as well. Also, the celebrations at the end of each month will be back starting from this month because we need little time to show our victory and hard work we do each month. Life won't be that fun if we don't give ourselves a moment to celebrate what we have achieved and inspire each another for another for more. Also, I got a new apartment in our mansion because I needed it to help me work on my blog and everything with no noise or anything. Writing and doing related stuff need focus, concentration, quiet environment as well which is the main reason for all of it. I'm planning to get my self a new apartment somewhere else because I can do blogging and streaming at the same time. I will see how it will go, but for the next couple of months, I will be at the current apartment. The last thing I want to say is this time, I'm going to be blogging more often than usual and improve my content while sharing posts every now and then. I will do my best to provide content as much as I can every week since I have an apartment which allows me to set a schedule and work easily on it and I hope you will enjoy it. This is a wrap for my post and I will see you in the next post. Please stay safe and have a good day till then. Always nice to hear what people are up to! I hope you get everything done you want! Time flies! I cannot believe 2018 is almost over and it's time to look back and see how far we've gone. Motivational stories are always uplifting. I cannot wait to read more from you. Sometimes, our plans don't turn out the way we wanted, we just have to learn, grow, and start over. Wow, you got a new apartment in the mansion? That must be so cool. It must be nice to have your own little space in such a large residence. I’m team Xbox. Lol. I think adding motivational stories would be a great way to help others.